The numerous interconnecting roads and trails of the eastern Santa Monica Mountains can be combined to create trail runs ranging from a few miles to marathon length or more. One of my favorite trails in this area is the Garapito Trail — a winding, up and down trail through dense, old growth chaparral. As a result, there are several runs I like to do that start at Marvin Braude Mulholland Gateway Park, and end by doing the Garapito Trail, Bent Arrow Trail and a short hop on Mulholland back (west) to the dirt extension of Reseda Blvd. Marvin Braude Mulholland Gateway Park is at the southern end of Reseda Blvd. on the San Fernando Valley side of the Santa Monica Mountains. Each run in the series starts the same way, going up to Mulholland using the single track trail that forks right off the fire road near the start, and then heading southwest a short distance on Mulholland to Fire Road 30, which works south to the Hub. Here’s a Google Earth image that shows the route up to the Hub and the return route via the Garapito and Bent Arrow Trails. The shortest run in the Garapito series is the 7.5 mile course described in the post Christmas Berry. Somewhat longer and more strenuous is the 12.2 mile course down to Trippet Ranch that is described in Musch Trail Mule Deer. A very demanding run in the series is an approximately 26 mile route out to Saddle Peak and back. Additional variations are possible — the popular run out to Parker Mesa Overlook and back tacks on about 6 miles to any of these routes. Today we did a medium length run in the series — a 17 mile loop with about 3000′ of gain/loss that takes Trailer Canyon fire road down to Michael Lane, and after a short jaunt on pavement, follows the Santa Ynez Canyon trail through classic coastal terrain up to Eagle Springs fire road near Trippet Ranch, and then on to the Musch and Garapito Trail. Here’s a Google Earth image of a GPS trace of the route. 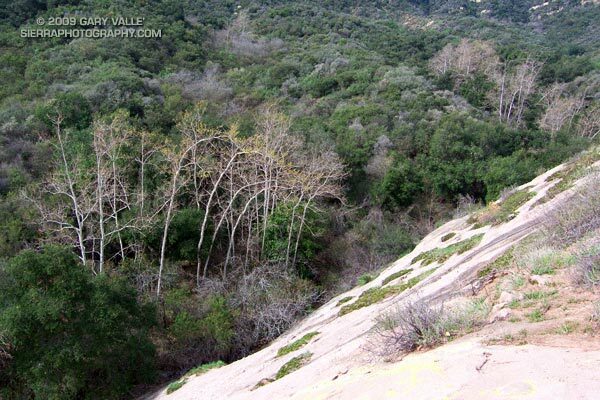 The title photograph, taken from a rock outcrop in Santa Ynez Canyon, is from a run in February 2009.